Sisteron is a beautiful pre-Roman town with 4000 years of recorded history. Built on the banks of the Durance River it’s referred to as the Gateway to Provence as it is wedged in a narrow gap between two long mountain ridges and of course due to its proximity to Provence. In 118 BC, the Romans built the Domitienne Way, a roman road linking Spain, France and Italy. It passed through Sisteron on the way through the Southern Alps and onwards to Italy, opening the town up to France and Europe. Sisteron managed to escape the barbarian invasions after the fall of Rome, but was pillaged so thoroughly by the Saracens that it didn’t regain its prosperity until the 11th century. Due to its wealth, Sisteron was first fortified by the Counts of Forcalquier in the 11th century. This medieval fortress can be seen today and is a spectacular sight (see above). It has served it's purpose throughout many wars and uprisings!! In 1483 during the reign of Louis XI, Sisteron re-joined the kingdom of France. Around this time there were seven plagues that killed two thirds of the population. Between 1562 and 1594 the Protestants and Catholics fought over the town and its citadel in the War of Religions. During this time the walls of the town were built. The plague returned in 1630, and typhus in 1744, killing many of the town's population. During the French Revolution the town remained Royalist. When Napoleon marched through the area in 1815, he defeated the city in order to continue on to Paris. Had the royalists had the time to destroy the bridge de la Baume, Napoleon’s march may have ended there with very different historical consequences. In the 19th century some major reconstruction work was carried out on the citadel, particularly on the north side of the fort. At the end of the 19th century the citadel lost its military purpose and was turned into a monument. During World War II, the resistance managed to liberate the political prisoners being held in the citadel. The town later suffered major damage from allied bombardment. From 1956, the citadel has been restored and is looked after by a group of associations, The Citadel and Fort. Perched high on a rocky ridge the fortified citadel has some great views. The fortress includes a medieval walkway (see photo) and chapel plus four bastioned terraces that face the town. The Devil's Watchtower, dates from the 14th and 17th centuries and overlooks the Durance River. Legend has it that the mason who built it sold his soul to the devil for help, hence the name. The foundations of the medieval chapel and its terrace with their 12m high supporting arches are also very impressive. Another interesting feature is the bomb-proof shelters cut out of the rock on the north side of the ridge, dating from the 19th century. There is also the 19th century staircase cut out of the rock, 365 steps in total, linking the fort with one of the gates and the river. 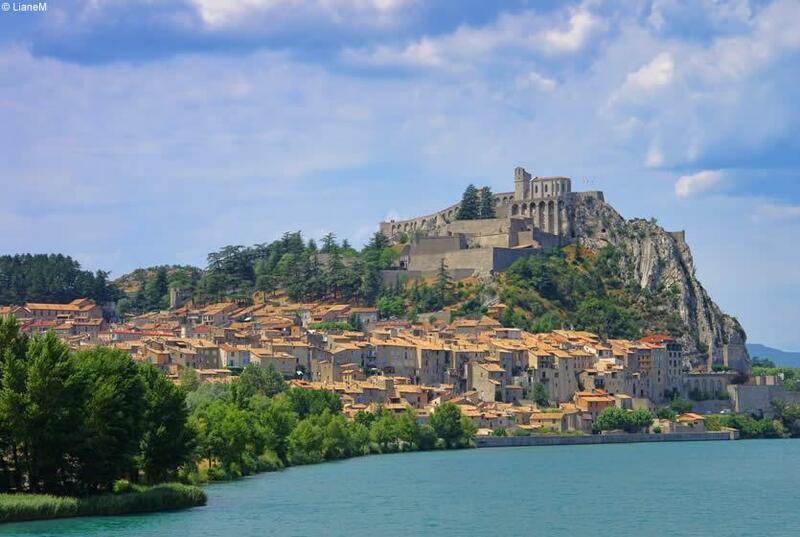 With its typical Mediterranean climate, its Provencal architecture, beautiful cobbled streets and tangible history, Sisteron makes for a great day trip from Gap.